I spotted these tri-berry muffins not too long ago on RecipeGirl’s blog. A Barefoot Contessa Recipe, these muffins are moist, sweet, and a yummy yummy treat! I used all frozen berries and they came out beautifully. 1 C. mixed berries, fresh or frozen. A mixture of frozen blueberries and raspberries works well. If using strawberries, fresh is better than frozen. Be sure to dice. Preheat the oven to 375°F. Place liners in muffin tin. Sift flour, baking powder, baking soda, salt, cinnamon and sugar together in a large bowl. Stir with a whisk to combine. In another bowl, combine the milk, eggs, butter and vanilla. Add the wet ingredients to the dry, and stir until just combined. There might be some lumps but don’t overmix the batter. Fold in the blueberries, raspberries and strawberries. Spoon batter into the muffin cups. Bake for 20 to 25 minutes, until a cake tester comes out clean and the tops are nicely browned. Ali, I think it was the cop-out boxer shorts in the Risky Business remake commercial that did poor Archuleta in. He’s so cute, but I guess Cook had bigger, well… muffins, dancing in his tighties and all. These look terrifc and I’m excited that we’re on the brink of berry season! ha! you’re funny. I cannot believe Archuleta lost. I was in total shock. He’s so clearly the better singer … but I guess that’s not all that counts. yes, I cannot wait for berry season, too. Hi Ali, Glad you tried these and liked them! I’m a David Cook fan myself. I just couldn’t see myself buying albums made by a 17 year old. I think DA will be great in a few years… kinda similar to Michael Buble. I just made these this morning. Delicious! Deanne — wonderful to hear this! DAVID ARCHULETA IS ALIVE AND DOING WELL!!! He is releasing his 6th studio album on March 26th 2013. He has done many concert tours here and around the world. I have been to over 20 of his performances and he is amazing live! He starred in a mini series in the Phillipines in Feb. of 2012. Currently he is away on a 2 year mission in Chile and is set to return in March/April 2014. Even though he is gone he has left music for his fans. His voice has only gotten richer and more beautiful as he has aged. He is now 22. Check out many videos of his performances on youtube. BTW these muffins look delicious. I’m definitely Pinning them. It’s so funny that I stumbled across this page via Pinterest. I’m a HUGE David fan. Holly, I love it. I will definitely have to check up on him. I haven’t listened to anything of his in ages, but I remember loving his voice when he was a contestant. Oh good, I won’t have to pick out the strawberries of my bag of froz mixed. I made this today for Mother’s Day and they turned out really great! Everyone loved them, especially my mother; although I only had 95 grams of frozen berries (a little over a 1/2 cup) so I had to adjust and halve the recipe. Overall, beautiful, soft and, delicious muffins. Definitely a recipe I’ll make again! I do recommend you make this, regardless of the occasion. Simple yet amazing recipe! Thank you so much Alexandra! So happy to hear this, Nikole! Glad halving the recipe worked. I haven’t made these in ages. You are inspiring me! These look delicious! Any suggestions about tweaking this recipe to make it eggless? Just made these tonight. Yum! I was trying to use up blueberries & raspberries from my deep freeze so this was perfect. as oter olks consider worries that they just do not know about. You managed to hitt the nail upon the highst and outlined out the entire thing without having side-effects , oyher folks ould take a signal. Will probably be again too get more. Thanks! You ccould definitely see your skills within the workk yoou write. Really good, will make again for sure. Moist, not too sweet and love the cinnamon, MMM. Anyone know the approximate calorie per muffin? I made 12 muffins. Wonderful to hear this, Sara. I don’t know the calorie count. If you enter the ingredients into My Fitness Pal, you should be able to get the info. Wonderful to hear this, Jaime! Made these for my birthday. Doubled the recipe using the scale 2x. Waaaayyyy too much flour. Complete disaster. 11 cups of four to 1 and 1/2 cups of milk?? Had to melt another stick of butter put in another cup and a half of milk in order to get even close to moist batter. Needless to say, it was way over mixed and flavorless. Used up all my flour and butter… no idea what I’m going to do now. 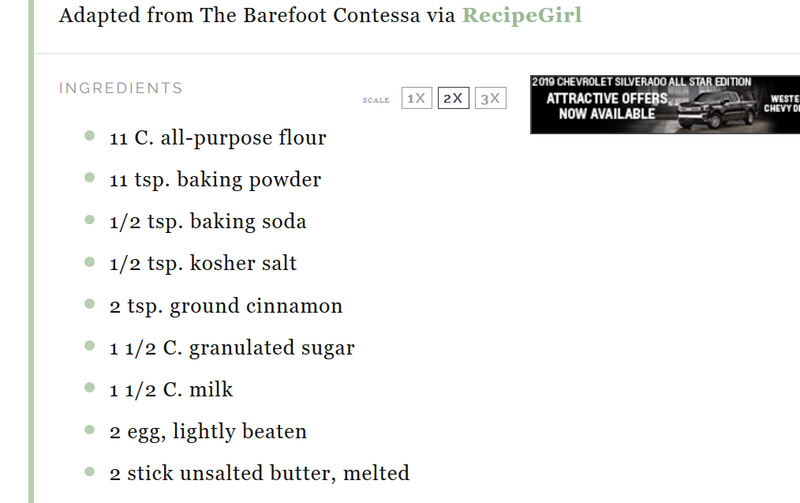 I’m confused … double the recipe is 3 cups of flour. Where are you getting 11 cups? Ugh, so strange. I hate technical issues … again, I’m sorry for the trouble, and I’ll likely have the scaling feature removed. Okay, so I figured out what went wrong. 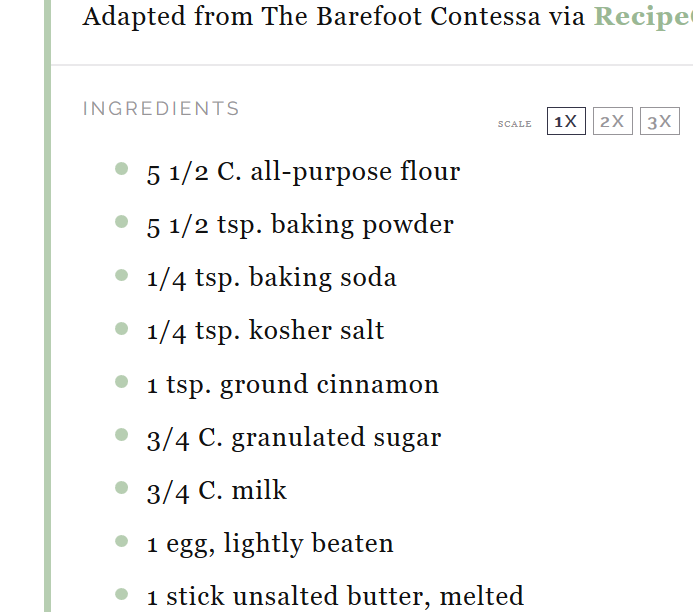 If you click on the “2x” scale it jumps the flour and the baking powder way up to 11. I hadn’t seen the original measurements, but I did question if that was right. So I clicked on “1x” on the scale and it goes back to 5 1/2 respectively and the 1 1/2 cups of flour never returns. Something seems wrong with that program. Very bizarre … I just emailed the people who keep the plugin updated. It’s a new feature. I’m probably going to shut it off bc if issues like this arise, then it’s really not a helpful tool. Sorry for the trouble here.